Alongside NVIDIA's last remaining architecture disclosures about Tegra 3, ASUS is revealing more information about the world's first Tegra 3 tablet. The Prime is much thinner than its predecessor, even thinner than the Galaxy Tab 8.9 and iPad 2 at 8.3mm. It's also the second lightest 10-inch Android tablet we've seen at 586 grams, a tad heavier than Samsung's Galaxy Tab 10.1 (565g). Unlike the original Eee Pad, the Transformer Prime is all aluminum. The Eee Pad Transformer Prime will be available in two colors: champagne gold (pictured above) and amethyst grey (in the gallery below). ASUS is using the higher quality chassis as a justification for driving prices up by $100. The Transformer Prime is now priced identically to the iPad 2, although you get twice the NAND (32GB/64GB instead of 16GB/32GB). The original Transformer will remain on the market at $399, the Prime simply occupies the space above it. The display resolution remains unchanged at 1280 x 800. It turns out that all of those high resolution tablet panels we've been waiting for are in very low supply and very expensive right now. Whatever is in good supply appears to be bought up by Apple for the next iPad. 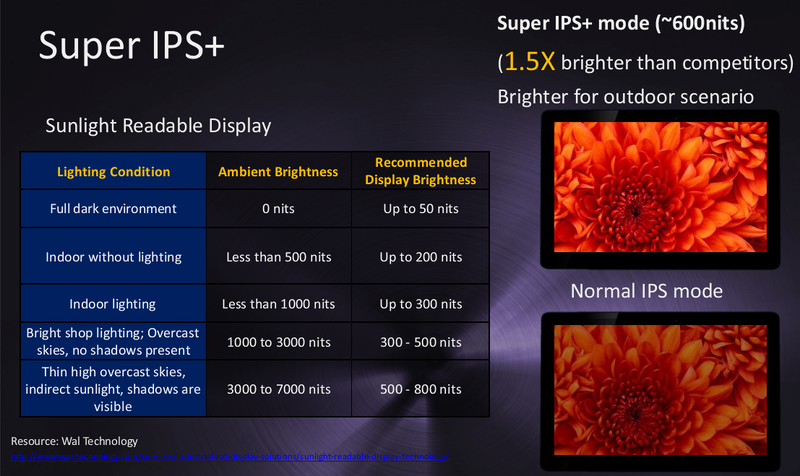 The display is an IPS derivative ASUS is calling Super IPS+. You still get the wide viewing angles, but ASUS is promising up to 600 nits in its brightest mode. If ASUS can indeed achieve this we'll be looking at the brightest 10.1-inch Android tablet on the market. I am skeptical however, especially considering the difference between ASUS' measured brightness and what we recorded in our Zenbook review. ASUS is using an oleophobic coating on the glass surface of the display, which should at least make fingerprints easy to wipe off. Apple includes a similar coating on the iPad/iPad 2's display, however fingerprints are still a fact of life when it comes to even its touchscreens. There are two cameras on the Prime: 1.2MP front facing and 8MP rear facing (f/2.4) with LED flash. Despite the decrease in overall dimensions, the Transformer Prime features larger speakers than its predecessor (6% larger according to ASUS). The Prime comes with an integrated 25Wh battery, similar to its predecessor. Also like the original Transformer, you can purchase an optional keyboard dock for the Prime for $149 that will nearly double its battery capacity (+22Wh). The new dock is obviously slimmer than the old one and gives you a full keyboard, track pad, USB 2.0 port and SD card reader. 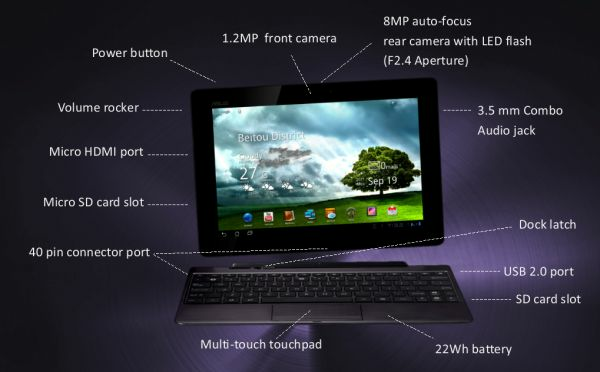 The Transformer Prime is expected to launch in the US in December with Android 3.2. ASUS is hinting at more details on Ice Cream Sandwich availability at the launch of the Prime next month. 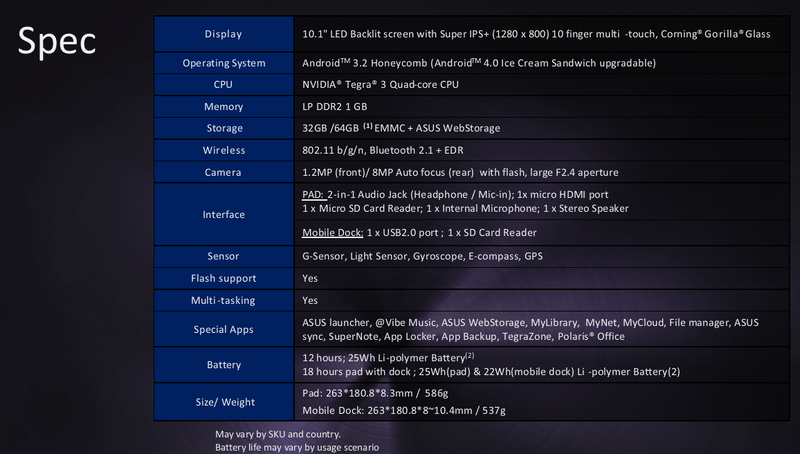 Based on what I've heard, I wouldn't expect ICS on Tegra 3 until early next year. While I would've liked to have seen a higher resolution display, ASUS appears to have addressed many of our complaints about the original Transformer. We'll obviously have to wait until next month to find out for sure, but it looks like there may be a killer Android tablet out before the year is up. I wonder why they still stuck with this instead of a standard SD slot. I don't want to have to buy an adapter/dock to be able to read my camera's SD cards. Having built-in 3G/4G means a separate $50 cellular data plan for the device, above and beyond your existing cell phone plan. Are you ever out in the field with your tablet, but without your cell phone?